I’m kind of obsessed with breaded or “crusted” food lately. Why? Because the new kitchen has a new microwave/oven that has a “Crisp” feature. It even comes with a special “crisp”-ing pan and the way it works (I think) is that it microwaves, pilule convects and broils at the same time. So food comes out as crispy as if it were deep fried but without any of the grease. Oh, treatment and a pork cutlet only takes 12 minutes, shrimp only 8 minutes, etc. I used the leanest pork I could find, and I brined it beforehand to keep it nice and juicy. In lieu of homemade breadcrumbs, which I didn’t have time to make, I used whole wheat Panko made by a brand called Ian’s, which I thought were fantastic. The meat was juicy and the breading was really crispy. 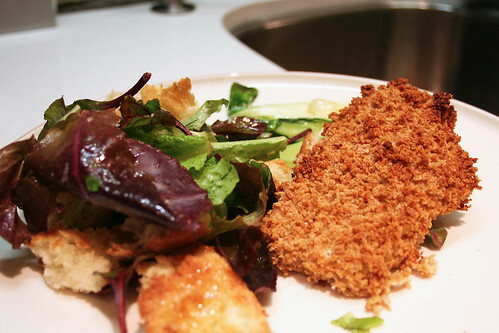 I served the cutlets with a nice green salad, homemade croutons made from stale cibatta and some sauteed bok choy. Cutlet recipe below. First, brine the pork by throwing the water, salt and pork in a large (gallon-sized) Ziploc bag. Let the pork sit for 30 minutes. In the meantime, preheat the oven to 400°. Once the pork has brined, remove it from the bag, rinse it thoroughly and pat dry. In a medium bowl, whisk together the eggs and mustard. In another medium bowl, mix the breadcrumbs, salt and pepper. Prepare a baking sheet with aluminum foil and some non-stick spray. Start breading the pork by dipping it first in the egg mixture, then in the breadcrumbs. Repeat the process twice for each cutlet then place them on the baking sheet. Once they’re all breaded, place them in the oven for 15 – 20 minutes, depending on the thickness of the pork. They’re ready when the breadcrumbs are browned and crispy and the inside is juicy and a bit springy. Mmmmmm. I’m trying this some time in the next few weeks. I actually have some pork cutlets in my fridge right now.